Pumping can be used to relieve the pressure of painful, swollen breasts. It's also helpful to maintain or even increase your milk supply. Most of the time, you will be pumping to provide your child with breast milk in a bottle or to store your milk for use at another time. However, there are some occasions when you can't or shouldn't give your baby the breast milk that you pump. In these instances, you will pump and discard the milk, or pump and dump. Alcohol: Alcohol does pass through to your breast milk. 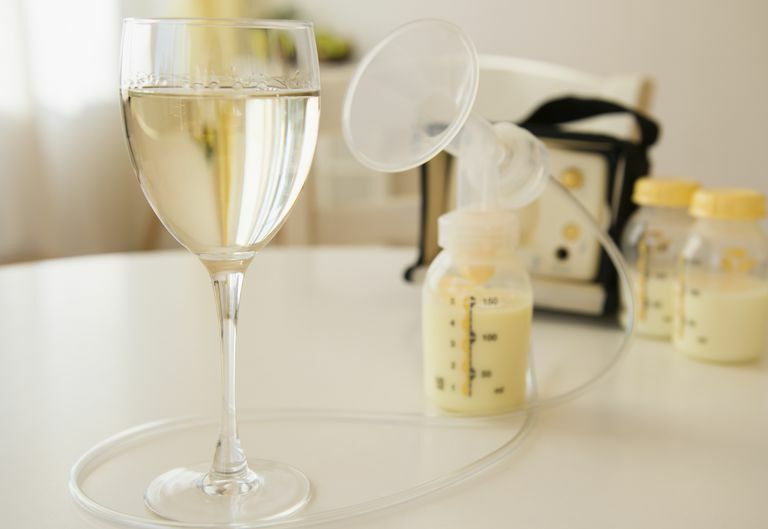 Although it's generally considered safe to have an occasional alcoholic beverage and still breastfeed, more than that could be dangerous to your baby. If you are going out to celebrate a wedding or planning an evening out with friends where you will be drinking more than one alcoholic beverage, you should not breastfeed your baby right away. Everyone is different and metabolizes alcohol at a different rate but the general rule is to wait approximately 2 hours per drink before nursing again. The amount of alcohol in your breast milk will go down as the levels decrease in your blood. If your breasts become full and uncomfortable, you can pump and dump your breast milk. But, it's important to note that pumping and dumping will not help you to remove the alcohol from your body more quickly. Recreational Drugs: No amount of recreational drug use is safe or recommended during pregnancy, breastfeeding or parenting for that matter. If you do take any recreational drugs, you should not breastfeed your baby. The chemicals of the drug travel through breast milk and can be extremely dangerous or even life-threatening for your child depending on the type of drug you use. If you are a regular drug user do not breastfeed at all and seek assistance. If you use a drug on a very rare occasion, you should pump and dump until the drug has completely left your system. Unsanitary Areas: If you are not in a clean environment and you have to pump to relieve painful engorgement you may want to dump that breast milk. Breast milk collected in these conditions could be contaminated and unsafe especially if your child is a newborn or a young infant. Thyroid Scan: A radioactive iodine uptake scan is sometimes performed to diagnose hyperthyroidism. Talk to your doctor to find out how long you need to wait to breastfeed after taking the radioactive iodine. While you are not breastfeeding, pump to relieve engorgement and maintain your milk supply but discard the milk since it's too dangerous for your baby to be exposed to the radioactive material that will enter the breast milk. Certain Medications: There are many medications that are safe to take while you're breastfeeding, so just because you need to go on a medication does not necessarily mean you cannot nurse your child. However, there are also many medications that are not safe to take while you are breastfeeding. If you need to begin a long-term medication that is not safe to take while you are breastfeeding, you will have to wean your baby. But, if you have to go on a short-term medication that is not compatible with breastfeeding, you may decide to only temporarily wean your baby until you have completed the medication and it is safely out of your body. During the time that you aren't breastfeeding, you can pump to help alleviate engorged breasts and maintain your milk supply. But, the milk that you pump can be not be saved for your baby so you have to throw it away. Improper Milk Storage: If you need to pump while you're away from your baby, but you do not have access to a refrigerator or a cooler to properly store your breast milk, then the milk can spoil. Breast milk can stay at room temperature for approximately 4 to 8 hours. The milk will last longer in a cooler room and it will spoil more quickly in a warmer room. Therefore, if you know you won't be able to get your milk to your baby or into proper storage within that time frame, you can go ahead and discard it. Questionable Foods: A healthy breastfeeding diet is ideal, but you can really eat almost anything while you're nursing and it won't usually cause any issues. However, there are a few foods that you should limit or avoid. Also, although not common, some ​foods can cause sensitivities in your breastfed infant. If you have an excessive amount of caffeine or you eat something that you know could cause a reaction in your baby, you can pump and dump to prevent your baby from exposure to these types of irritants.